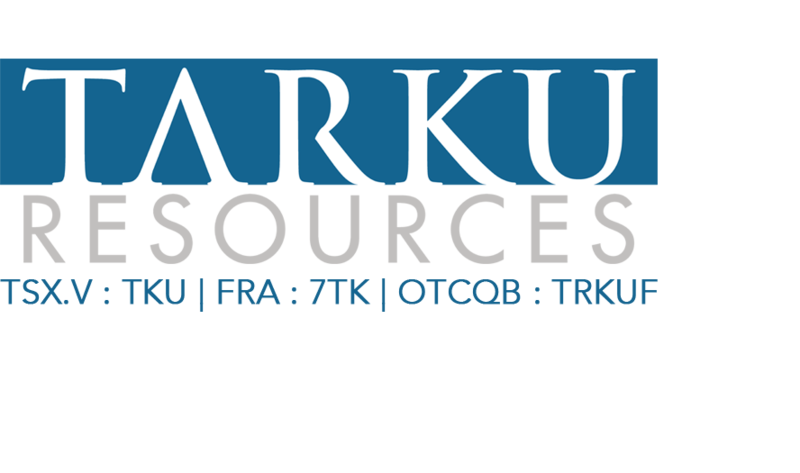 MONTREAL, Jan. 31, 2019 - Tarku Resources Ltd. (TSX-V: TKU) (the "Company" or "Tarku") announces the scheduling of a 1,200 m drill program to commence during February 2019 on its wholly owned Admiral project in the Matagami area, Eeyou Istchee James Bay, Quebec. The program targets structures and major folds in a 1 to 1.5 km wide corridor identified by Tarku’s previous high-resolution geophysical activities and data compilations and that contains the Lac Olga Ouest gold showing located on the Admiral project (5.9 g/t Au, grab sample, GM 49140). The Company is also pleased to announce the recent completion of a 271 line-km high-resolution helicopter-borne magnetic survey over the main targeted area, previously identified through a till sampling program, on the Apollo and Atlas adjacent projects. Tarku believes the area has been under explored for gold. Tarku owns 3 projects in the Matagami area (Admiral, Apollo and Atlas) totaling 224 mining titles centered on regional faults including ductile shear of the Waswanipi River (RWSZ), a favourable setting for orogenic gold mineralization associated with alkaline rocks and porphyry intrusions. Tarku interprets this geological context as being similar to the Sunday Lake regional fault, host of the Detour Lake Mine or the Kirkland Lake Mining Camp. Tarku’s management believes that the gold potential of the Matagami sector has been undervalued and uses today modern geological models and exploration techniques to aid in the discovery of gold mineralization. Tarku cautions that the mineralization at the Detour Lake mine or the Kirkland Lake mining Camp may not be indicative of the mineralization that may be identified on the Company’s Matagami projects and is used as a conceptual exploration model only. The Admiral project is located west of Lake Olga and consists of 30 claims (1,667 ha) overlying the convergence of the Rivière Waswanipi (RWSZ) and Lac Olga (LOSZ) shear zones. The LOSZ contains the Lac Olga Ouest gold showing located on the Admiral project (5.9 g/t Au, grab sample, GM 49140) and Goldcorp’s high-grade deposit Indice Principal zone Olgalocated 10 km southeast of Admiral (14.75 g/t Au, 1.14% Cu and 10.3 g/t Ag over 1.50 m, GM 50632) (see www.tarkuresources.com). Tarku’s drill program follows a high-resolution helicopter-borne magnetic survey (see press released dated November 29, 2018) and recent data compilation, covering the entire Admiral Project, which has aided interpretations of the mineralized systems and, more importantly, identified new gold targets. The interpreted data identifies high priority drilling targets defined by the intersection of structures, the axial planes of folds, historical electromagnetic Input anomalies and by a non-magnetic signal or low magnetic features which may represent silica-tourmaline alteration zones as observed at the Indice Principal zone Olga deposit. In January 2019, Tarku completed a 271 line-km high-resolution helicopter-borne magnetic survey over the main targeted area of Apollo and Atlas projects. Flight lines were surveyed at a 100-metre spacing and was conducted by Prospectair (Gatineau, Quebec) and Dynamic Discovery Geoscience (Ottawa, Ontario) to aid interpretations of the mineralized systems and identify new gold targets within the recently define favourable zone. Following its 2017 till sampling program, Tarku identifies a 6 km wide favourable zone along the regional Rivière Waswanipi shear zone (RWSZ) that may be the source of the gold grains sampled (see press release dated February 28, 2018). Three targets within that 6 km stretch, (Apollo XI, Apollo XII and Apollo XV) were considered priorities for the upcoming work phases as they were corresponding to magnetic highs associated with carbonate-hematite-magnetite alteration along or near the regional gold-bearing RWSZ. This corridor contains the Rivière Waswanipi gold showing (2.36 g/t Au over 1 m; GM 51193) hosted in a porphyritic dyke and tuffs as well as several porphyry intrusions bearing anomalous gold values on the order of 0.1 to 0.9 g/t Au over 0.6 to 5 m (GM 52712). After receipt of the final data, Tarku’s management will be able to identify and prioritize additional drilling targets along the regional RWSZ and will evaluate the possibility of completing a drilling campaign to test new gold targets during 2019. Tarku is an exploration company focused on generating sustainable projects for precious, base and strategic metals by conducting exploration in areas with strong geologic potential and high levels of social acceptability. Project generation is the foundation of mining development, and Tarku’s vision is to generate exploration projects with excellent potential for mining development for prospective partners or buyers. Tarku has 74,648,797 outstanding shares, of which approximately 70% are owned by insiders and major shareholders.